Neon Jump Night is Rockin’ Jump’s exclusive after-dark jump experience. 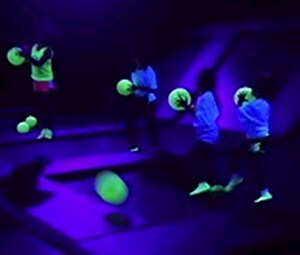 Neon Jump Night features special strobes and black-lights along with all the top hits to make your night “Rockin”. Included in your admission is a Neon Jump Night t-shirt to round out your reactive look. Enhance your outfit with glow bands or other accessories to really stand out! Whether you are dancing, jumping, or just enjoying a night out with friends, Neon Jump Nights is sure to light up your night! Make Neon Jump Nights your “After Dark” go to experience! Pre-purchase your tickets as we sell out fast! $21 for 2 hours of jump if you are already wearing your Neon Jump Night T-Shirt. Neon Jump Night Shirt must be worn to jump. Rockin’ Socks are also required and are $3 per pair.